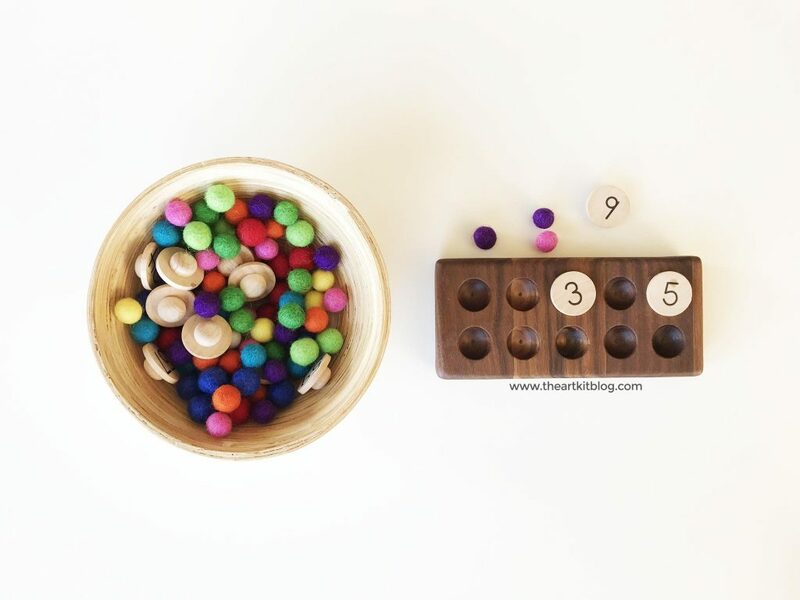 We are so excited to share with you some simple + fun math activities for preschoolers that both you and your little ones will love. Read on for all the fun pictures. 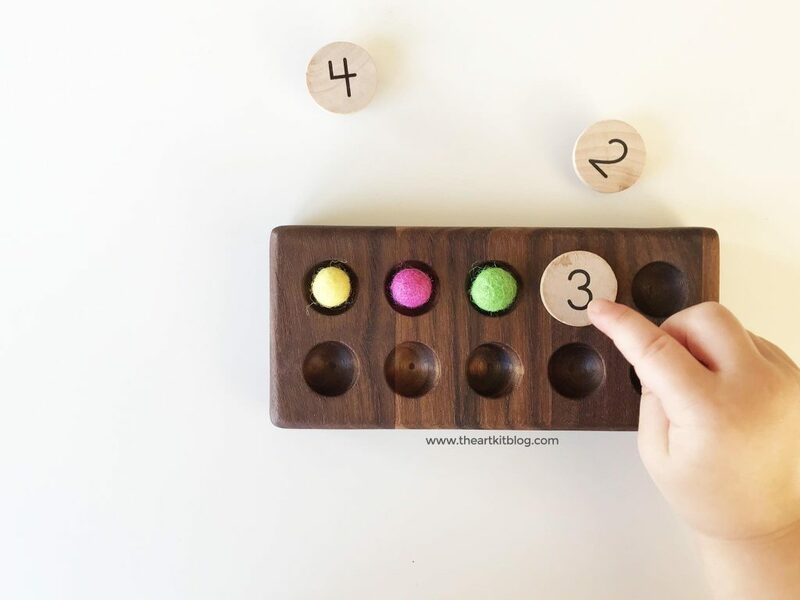 Number recognition and learning to count is an important skill but at the tender preschool age, learning these important skills is best done through play and hands-on activities. 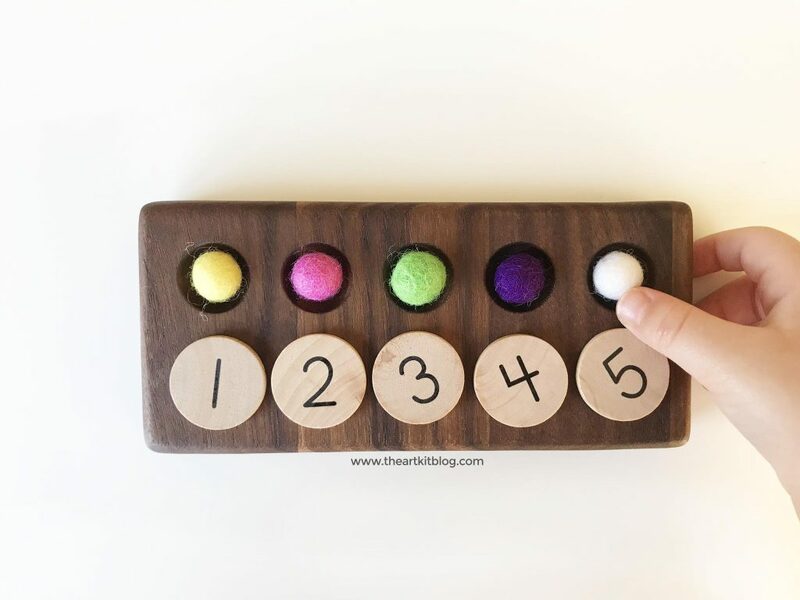 We are so excited to share with you a gorgeous product that we’ve been using that will give you endless opportunities to teach your preschooler about their numbers. 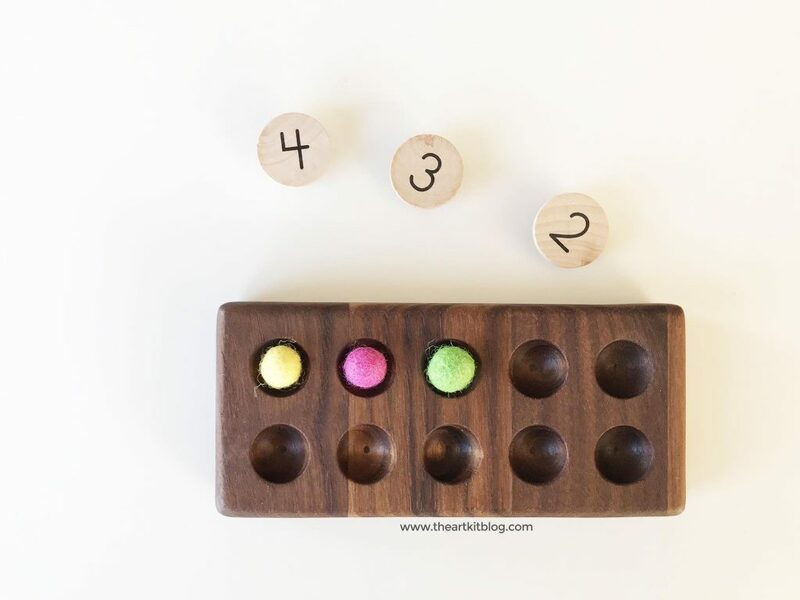 There are so many ways to play, including counting, skip counting, addition, subtraction, number recognition, color recognition, and more. 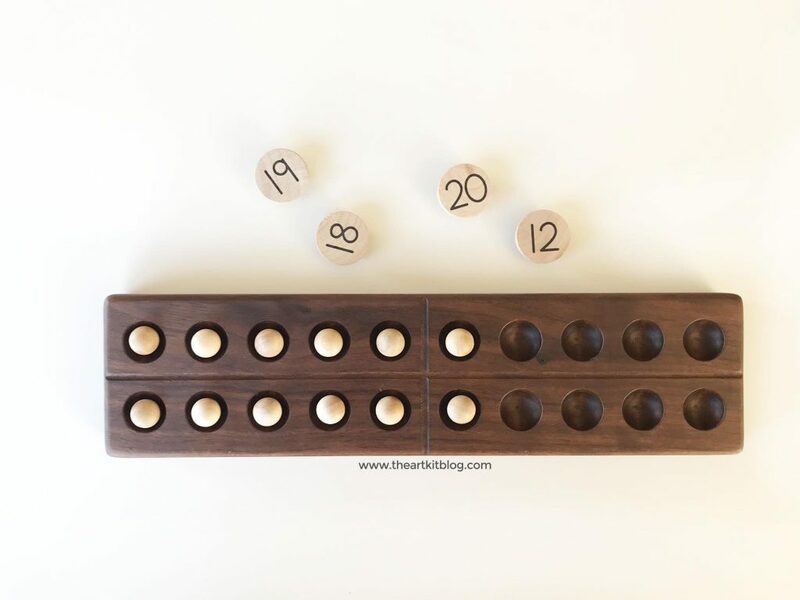 Three different sized boards are available – ten frame, twenty frame, and 100 board frame (we purchased one of each), which are perfect for different math skill abilities. I started off by placing five pom poms on the board and then asking Miss 2 (almost 3), to count them. Once she counted, I placed the number discs below them, in the correct order, while counting to five again. Next, I placed three pom poms on the board, placed three different number discs on the table, and asked Miss 2 to count the pom poms. One, two, three. I then asked her to pick up the number three disc and place it on the board. You could also place the number discs out and invite your child to arrange them in the correct order on the board. Or, give them two discs and ask them to add them together. Larger sized boards are also available. On the 100 board, we skip counted by 2’s. Older children can count to 100 while the younger children work on the smaller boards. I can’t recommend these quality math tools enough. They honestly saved our math days for our older child and gave the younger ones something to quitely work on during schooltime. 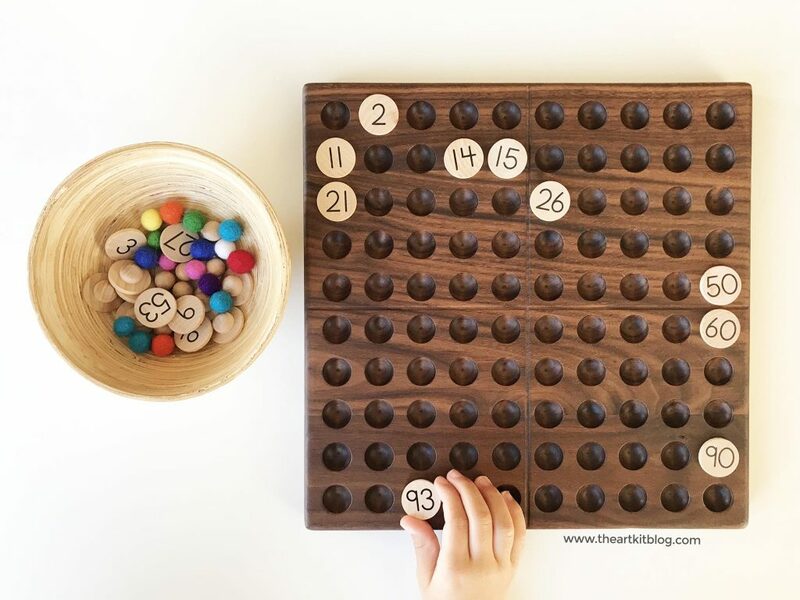 If your children’s lessons have turned tedious and math lessons have become a struggle, this may be the answer for you! If you have older children (elementary level), stay tuned for another review post for additional products to help with fractions and multiplication! I even found myself peacefuly working on the hundred board, filling in the numbers from 1-100. The smoothly sanded wood and fuzzy soft wool pom poms were such a happy welcome to our school days. If you’d like to see what else they have to offer, from number boards to multiplication rings, visit their shop today. Visit the shop to place your order today. 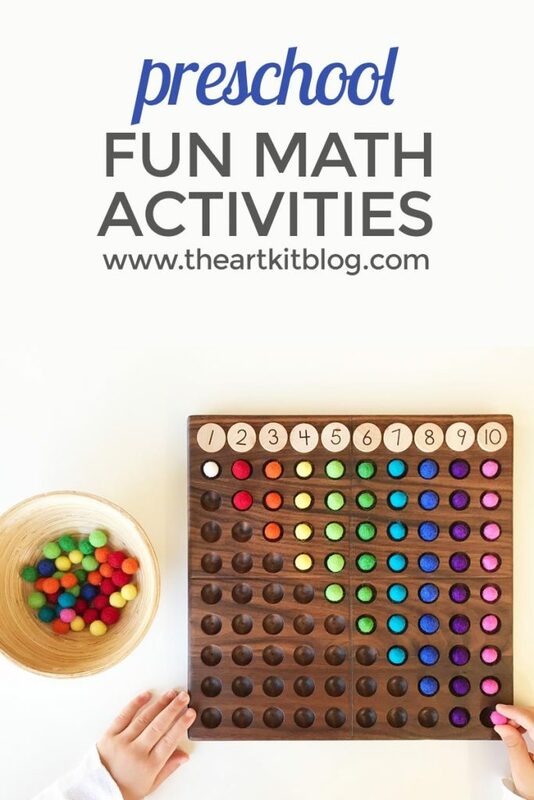 Do these math activities for preschoolers and beyond sound like something you’d be interested in? If so, please share this on social media. Or, pin this to save it for later. 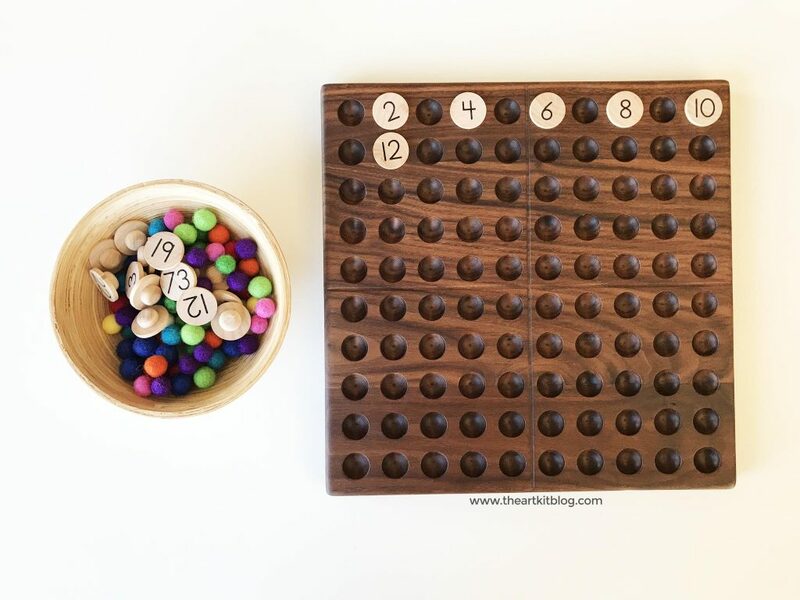 See all our recommended math games here.